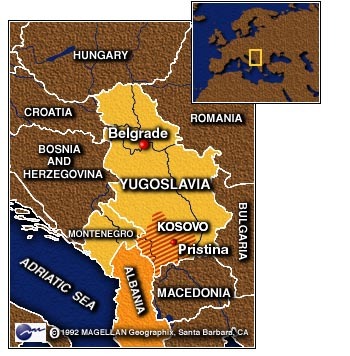 PRISTINA, Yugoslavia (CNN) -- Explosions ripped through Kosovo and outside Belgrade on Wednesday evening as NATO launched cruise missiles against Yugoslavia, following through on a long-standing threat to strike if Serbs refused to sign a U.S.-drafted peace accord for Kosovo. "The time has come for action," NATO Secretary-General Javier Solana said in a statement announcing military action had begun. 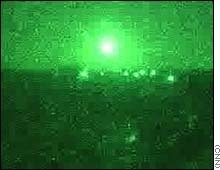 Two orange explosions lit up the night sky outside Belgrade around 8 p.m. local time (2 p.m. EST) in the direction of a military base. The provincial Kosovo capital of Pristina was plunged into darkness shortly afterward, and sporadic automatic weapons fire was heard across the city. The explosions came about 30 minutes after air raid sirens echoed throughout the city for the second time in the day. Minutes after the attack began, U.S. President Bill Clinton told reporters at the White House: "We and our NATO allies have taken this action after extensive and repeated efforts to obtain a peaceful solution to the crisis in Kosovo." Clinton said the military strikes have three objectives: to demonstrate NATO's resolve, to deter Belgrade from launching more offensives against Kosovo Albanians and to degrade Yugoslavia's military capabilities to carry out future attacks. The NATO attack comes a day after senior U.S. envoy Richard Holbrooke failed in a last-minute attempt to persuade Yugoslav President Slobodan Milosevic to agree to the Kosovo plan, which would grant local autonomy to ethnic Albanians but not independence. Serb leaders have continued to reject a key element of that plan: allowing 28,000 NATO-led peacekeepers into the province to police the peace. 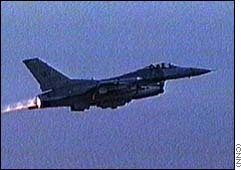 Pentagon sources said the attacks would be carried out on targets throughout Yugoslavia. Defense officials are most concerned about mobile missile launchers that can shoot down jets up to 25,000 feet. French President Jacques Chirac, in an address on French television, said France is participating in NATO airstrikes because Serbia has demonstrated "unacceptable behavior for too long with regard to the Kosovo Albanians." "I know that the French people will understand that we had to act," Chirac said. "Before the unjustified and incomprehensible obstinacy of President Milosevic, the allies unanimously agreed that there was no other choice than to intervene militarily against targeted Serbian objectives. This in order to contain a tragedy which endangers the stability of the Balkans more and more." Shortly after the attacks began, Russia, which has long opposed such strikes, recalled its NATO ambassador from Brussels. At the United Nations, Russia called for an immediate meeting of the U.N. Security Council for 4 p.m. EST. Russian President Boris Yeltsin called the attacks "outright aggression against Yugoslavia" and said that his nation reserves the right to take "adequate measures including military ones to ensure its security and that of Europe." Earlier, Milosevic vowed to defend his country but urged the citizens of Yugoslavia to remain calm. He told his nation that the Yugoslav parliament made the right choice to reject international troops on its soil, but added, "We want to continue constant efforts for a peaceful resolution of the problem in Kosovo." He said in the long run the problems of Kosovo could only be "resolved in a peaceful and political manner." Serb military officials in Pristina said they had repositioned their troops in the region to put their heavy weapons in less vulnerable spots. They said they wanted avoid being provoked by the rebel Kosovo Liberation Army and to avoid the expected strikes. NATO intelligence reports showed a continued buildup of Yugoslav troops, Serb police and military hardware in and around Kosovo. There were indications Yugoslav tank battalions had moved a further 16 tanks into the Kosovo province itself. A NATO official said that move is a clear indication that Yugoslav forces are poised "for a full-scale offensive" against Kosovo's ethnic Albanians. Correspondents Brent Sadler and Christiane Amanpour contributed to this report.